Despite the dramatic arrival of winter, the housing market has retained much of its summer heat. Three decisive trends continued through November: Buyer activity outperformed year-ago levels, inventory dropped and, for a ninth consecutive month, home prices rose compared to 2011. In simpler terms, more homes sold in less time at higher prices and for closer to asking price than last year. During November, 3,843 homes closed, 20.0 percent higher than November 2011. There were 3,587 pending sales, a 12.6 percent increase over last year. The median sales price was up 16.9 percent to $173,000. The 10K Housing Value Index showed a more modest 9.1 percent increase to $173,113. The number of homes for sale fell 29.4 percent to 13,860 active listings – the lowest number since January 2003. Consequently, seller sentiment has become even more critical to housing recovery. There is evidence of improvement on this front. 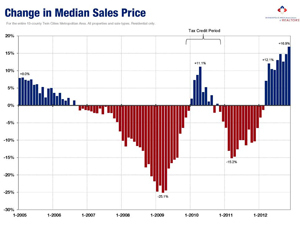 The median sales price has risen for nine consecutive months. Less supply, more demand and a healing distressed segment have enabled this trend. Overall, new listings were up 0.2 percent. However, traditional new listings were up 27.8 percent while foreclosure and short sale new listings fell 21.1 and 45.7 percent, respectively. Thus, a pullback in bank-mediated listings has diluted a significant increase in traditional seller activity. Similarly, closed sales were up 20.0 percent overall, but traditional sales were up 50.4 percent while foreclosures and short sales were down 14.9 and 2.7 percent, respectively. As for the shifting market share, traditional sales made up 64.2 percent of sales, foreclosures 24.6 percent and short sales 11.2 percent. Months’ supply of inventory fell 40.6 percent to 3.4 months. Figures below 4.0 months of supply are typically hallmarks of sellers’ markets. Homes tended to sell in 104 days, on average, 25.9 percent quicker than last year. Sellers received 94.3 percent of their list price, on average, up from 90.9 percent last year. Conventional financing comprised 48.5 percent of all closed sales; FHA financing was used on 23.1 percent of sales; cash buyers made up 20.6 percent of sales.